By now everyone has heard how wonderful oatmeal is for you. It’s good for your heart, it’s a cancer fighting agent, it’s a great source of fiber, it’s low in calories, but did you know it can be used for more than just filling your belly? This week we came up with 19 unusual frugal living tips using this wonderfully healthy staple. There are several different types of oats that you can buy: instant, quick, rolled, the list goes on. I like to use the Irish steel cut oats, the pieces are smaller so it’s easier to eat, and they also contain more nutrients because of the way that they are hulled and cut. They’re a little more work than most oats but the benefits are worth the extra effort. Always consult a doctor before using oatmeal as a treatment. 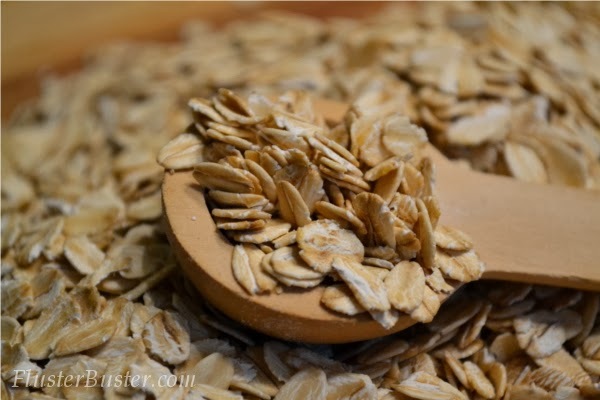 Burns – to soothe, apply cold, cooked oatmeal to the area. that the water hits it while filling the tub. Soak for at least 15 minutes. Save the oatmeal filled pantyhose to rub on your itchy skin later. hours before any strenuous exercise. tablespoon of honey to your bath water. face and leave it on for about 15 minutes and rinse. skin and leave it on for about 15 minutes before rinsing. ground oatmeal and baking soda. Work the mixture into dry hair and brush out. meatloaves and meatballs. Plus your adding a good source of fiber to your diet. let it sit for 5-10 minutes and wipe away. Soups and Stews – to thicken, use ground oatmeal. oats and flour. Add a few drops of food coloring and water. filling the tub. Work the oatmeal water throughout the dogs coat and rinse. of oatmeal in the refrigerator. Curious to find out if you have any household tips for using oatmeal? Wow! I had no idea! Thanks for sharing all these great ideas. Thanks for this post. I love knowing all of the uses for things, like oats. And thank you for sharing this at our Making Monday link party. We really appreciate it. I've pinned it to our board and also to one of my personal boards. I've used it on my face before, but never on burns–thanks! Hi Robin. Your interesting post on the Unusual Uses for Oatmeal will be one of my top 5 featured posts on My Sweet Mission tonight! Congrats and stop by to grab a featured button, you deserve to brag a little! I had terrible indigestion and heartburn one night and my usual medicine wasn't working. For some reason, I thought I should eat a large spoonful of dry oatmeal. I got up, ate some and my stomach settled down immediately! I have had this work several times since. Try Face Book to find your book if you haven't found it already. Face Book has done amazing things to find people maybe it will work for a loaned book. This is great! Thank you for sharing! I will definitely be using oatmeal as a foot moisturizer in the near future. You can make oatbflour by running oatmeal through the blender then use it in place of flour in brownies. You can also use it make gravy but the texture takes some getting ised to. Thanks for the great tips. Thank you very much for this interesting information about oatmeal. It’s crazy all of the things that you can do with it!